The urgency to develop relevant forms of 21st century leadership exists, as continued application of 20th century management practices will eventually incapacitate society. Positional leaders must transform schools from the assembly-line-of-learners era to the digital-information era. The future of societal progression is dependent on school leaders being able to directly shift their learning goals towards the era. If societal progression is to occur, schooling must not be maimed by yester-century retro-like industrialised management practices. Within this era industrialised management practices will manufacture diminished potential. Diminish human potential in schools and society will stride towards a diminished future. ‘If you want to maim the future of any society, you simply maim the children’ (Ngugi wa Thiong’o 1993, p76). Australia’s future prosperity is hardwired to the education sector. ‘Education is an enabler of productivity and growth for virtually every part of the Australian economy’ (Brown, D’Souza, Ergas, Harding & Harper 2014, p37). The overriding theme is that, a contextually relevant 21st century school requires leaders who are future focussed and can operate within exponential technological and social change. Schools require leaders who have the capacity to make sense of exponential change and be able to strategically implement across broad tacit domains such as teaching and learning relationships and organisational behaviours. Why are Australian schools still are locked in the cultures of the 20th Century? I would like to contend, that up to now the integration of technology has been approached through standardised management engineering, and this approach is now falling short of the actual need. It was implemented to integrate technology with past well-known well-established teaching practices. It did not instigate and or contribute to the development of a learning organisation. Despite the money spent and the opportunity to instigate adaptive practices school structures remained more or less much the same. Strong management practices were employed to bring about technological integration. A failure was that we as a Department did not look at positional leadership in itself as a process of technology implementation. Alan Reid in his overview of the Australian Digital Education Revolution emphasises the missed opportunity to instigate future focussed leadership activity over optimised management integration. ‘A genuine education revolution will look to the future not the certainties of the past’ (Reid 2009, p23). Soren Kaplan describes failed management when it is bogged down with a 20th century incremental-based improvement mindset, fastened on refinement-based practices and implementing certainty based priorities such as SWOT analysis, financial analysis, impact scenario, business modeling, strategic planning and reverse engineering. Kaplan’s reasoning is that, on the whole, leaders by reverting to control of process methods do not seize the opportunities within uncertainty, ambiguity and the fog which is the future (Kaplan 2014). Clay Christensen, in his description of leadership that is welded on data-driven analysis but employed within the scope to move forward, is actually operating within past parameters. Managers cannot step forward in times of uncertainty by employing past data and methods of implementation. Reversion to past data locks progress to past versions of success and or failure. From my experience, controller managers with skill sets limited to industrial productivity methods were unable to gain transformational opportunities within the rollout of the Digital Education Revolution and will not be equipped to effectively employ second wave 21st century intelligent technologies within a schooling structure. 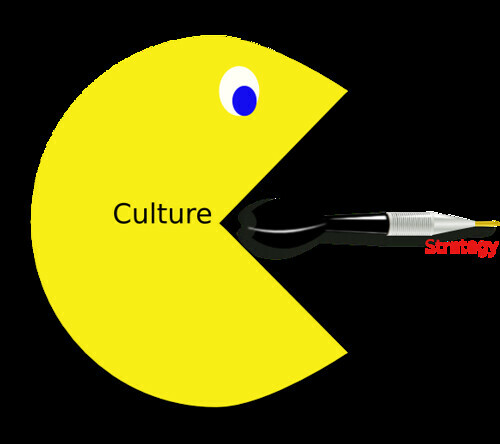 Culture eats strategy unless leadership has vision and is determined to be strong to that vision.